You are here: Home / Life / Should I Say Yes to Every Opportunity? Should I Say Yes to Every Opportunity? When in Australia …do as the Aussies do (isn’t that how the saying goes?). Before going abroad, I promised myself I would say yes to every opportunity that presented itself to me. I wanted to open myself to new experiences and new people, to make the most of my semester on the other side of the world. Living in Australia has, so far, been the most mind-opening experience of my life. I have done things that have made me realize I’m often capable of more than I think. 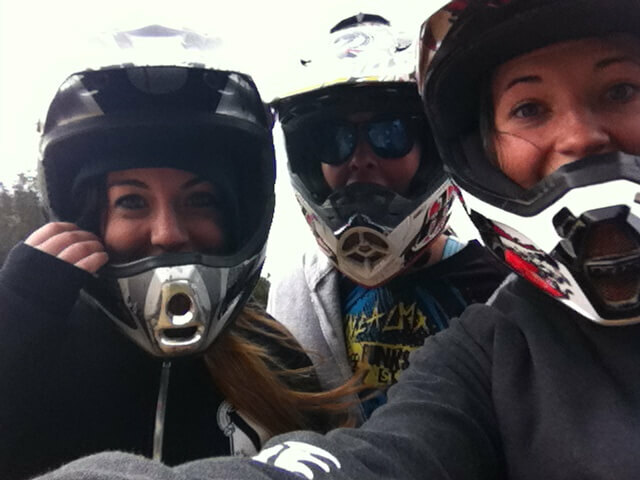 So when some new Australian friends offered to teach my friends and I how to dirt bike, I enthusiastically agreed. Let me tell you something I’m not capable of: dirt biking. That windy Friday morning my friends Cheryl, Kelsey and I waited bright-eyed and bushy-tailed outside my apartment for the boys to pick us up. We drove an hour to a suburb called Wollongong, joking in the car that we forgot our study abroad medical insurance cards at home. Once we arrived, the boys geared us up in helmets and got the bikes ready. We laughed at how ridiculous we looked, but deep down felt like total bad-asses. Australians are notorious for their love of sport and adventure. Our Australian friends fit this image perfectly, but they soon realized we might not. Kelsey immediately knocked one of the bikes over and let out a bloodcurdling shriek … the boys calmly set the bike right again and we were off to start our lessons. Australians are also notorious for their chill, “no worries, mate,” demeanor, and therefore assumed that the three of us would be fine with minimal direction. Unfortunately, in Cheryl’s case, “minimal direction” excluded where the brakes were located. She flew forward on the bike – we were all impressed with her audacity until we realized she had no idea how to stop. Our earlier joking about forgetting our medical insurance cards became awfully real as the bike wobbled violently and Cheryl’s arms and legs began flailing. Not knowing what else to do, she launched herself over the handlebars, completing a full front flip in the air and landing on her stomach in a pile of sand. We all stared at her, but she quickly sat up and burst out laughing. We began laughing as well, kicking ourselves for not capturing the stunt on video. The rest of the lesson was safer, but no less gawky. The boys would start the bikes – all we had to was quickly climb on, release the brakes and ease into the next gear before the bike turned off. Easy, right? Evidently not. We quickly discovered that my legs are too short to get on the bike in time. My new friend, Joey, however, was a dedicated teacher. After about thirty failed attempts to actually get my body on the bike, he resorted to lifting me onto it. I was flustered, but after just two attempts, it actually worked. I rode about fifty yards until I was unable to turn the handlebars and was brought to an abrupt stop by a bush. The day’s results were only slightly disastrous. Cheryl limped to the car with a swollen, scraped up knee. The bike crashed needed some replacement parts. I was sporting a large bruise that wouldn’t start fading for two weeks. But we weren’t dismayed in the slightest. We couldn’t stop laughing about Cheryl’s epic fall, we wore our new bruises with pride and we had solidified our friendship with the Aussie boys. It was the adventure that made this experience a truly Australian one for me. It was seizing an opportunity to do something I was pretty sure I wouldn’t be able to do, but doing it anyway. It was saying yes to something that scared me a little. Experiences like this one make me feel as though I have embraced the Aussie traits I love the most – the sense of adventure, the willingness to participate in any activity, the enthusiasm to experience life. I have learned that, in choosing to view every experience as part of a greater adventure, every experience is a positive one, bruises and all.